Served with Headquarters Battery, 57th Field Artillery Battalion, 7th Infantry Division 1947-48 Battery Commander, 57th Field Artillery Battalion, 7th Infantry Division 1948-49 Battery Officer, 674th Airborne Field Artillery Battalion, 11th Airborne Division 1949-51 Served with 187th Airborne Regimental Combat Team 1951-52 Served with Headquarters, X Corps 1952 Student, Armed Forces Staff College 1960-61 Instructor, Tactical Department, U.S. Military Academy 1961-63 Served with Headquarters, US. Strike Command 1963-64 Student, Naval War College 1964-65 Senior Advisor & Mission Coordinator, Vietnam 1965-66 Commanding Officer 1st Battalion, 8th Artillery, 25th Infantry Division 1967-68 Military Assistant to the Special Assistant to Secretary & Deputy Defense Secretary 1968-69 Deputy Chief of Staff (Plans), III Marine Amphibious Force, Vietnam 1970 Assistant Division Commander, 25th Infantry Division 1970-71 Assistant Division Commander, 8th Infantry Division 1971-72 Director of Planning & Program Analysis, Office of Army Assistant Vice Chief of Staff 1972-75 Commanding General, 2d Infantry Division 1975-76 Commandant, Command & General Staff College 1976-77 Deputy Commanding General (Combined Arms), Army Training & Doctrine Command 1977-79. 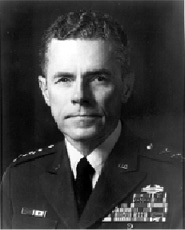 On May 29, 2004, Lieutenant General John R. Thurman III died at Walter Reed Medical Center. He was the brother of the late General Maxwell Reid Thurman, United States Army. Services will be held at the Fort Myer Old Chapel, Arlington, Virginia, on Tuesday, July 6, 2004 at 8:45 a.m. with interment to follow in Arlington National Cemetery. In lieu of flowers memorial contributions may be made in his name to the National Museum of the U.S. Army, (NMUSA), 2425 Wilson Blvd., Arlington, Virginia 22201. Died May 29, 2004 at Washington, D.C.